Mumbai, September 29, 2018: After an exciting weekend Gymkhana competition in Mumbai, Team INDONESIA including Adrian Septianto & Herdiko Setyaputra wins in the Double & Team Gymkhana categories in Round 2 of the AAGC (Asia Auto Gymkhana Competition) 2018. Team JAPAN secured second place in both the Double & Team Gymkhana categories, while INDIAN driver Achintya Mehrotra won the best driver in the Solo Gymkhana category. An international motoring extravaganza held in India for the very first time, Round 2 of the AAGC 2018 witnessed an audience of over 2000 people and 26 top-class Gymkhana drivers from over 10 APAC countries, including Japan, Thailand, Indonesia, Malaysia, the Philippines Singapore, Taiwan, Sri Lanka, Nepal, and India. With all drivers kitted in Volkswagen Polo track cars, all participants were evenly pegged against each other with the ultimate goal of navigating through a short timed loop, comprising of obstacles and choreographed manoeuvres such as 360 spins, J-Turns, Slalom and Figure-8 amongst others, while making the fewest errors. With 5 difference courses, the total run time of the heats were all under a minute, making it one of the most fast-paced motorsport events being held in India in recent times. Run under the aegis of FIA in conjunction with FMSCI (Federation of Motor Sports Clubs of India), the AAGC event acts as an entry point for budding young drivers to start a career in racing, in a safe, economical and practical way. Following are the top 3 winners in all three categories in Round 2 of the AAGC 2018. 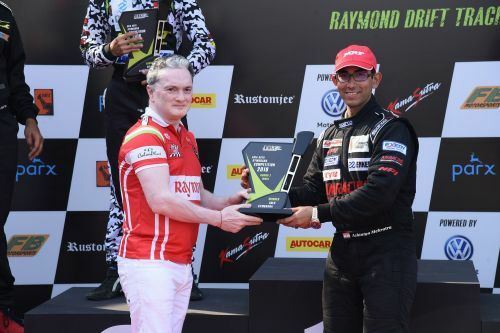 The event was sponsored by Kamasutra, Parx, Rustomjee Developers & MRF and is supported by VW Motorsport & Autocar India. MRF Supercross 2018: Double Win for Harith Noah in Round 3 of the championship.